The summer Olympics are fast approaching, and there are plenty of reasons to start getting excited. For example, 30-year-old fencer Ibtihaj Muhammad just qualified for the Olympics, which will make her the first woman from the United States to compete while wearing a hijab. Quite the milestone for Muslim women's sports in our country! Muhammad also joins a long line of Muslim women who have achieved great things in sports, both during the Olympics and elsewhere in the sports world. Ibtihaj Muhammad, who is from New Jersey, first began fencing at the age of 13 precisely because it was a sport where she didn't have to alter the uniform, thereby allowing her to sidestep a common dilemma for Muslim women who want to play sports but also choose to adopt modesty standards that make play more difficult or conflict with existing uniforms. 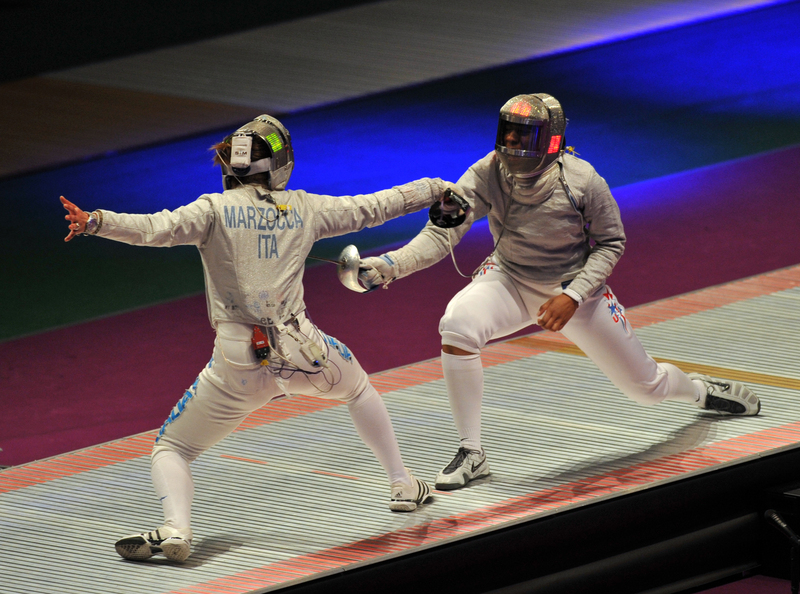 Muhammad was on the fencing team for Duke University, and began fencing professionally after graduation, quickly amassing titles. She told BuzzFeed that the lack of diversity in the sport is one of the things that drives her. "Historically, [fencing has] always been a white sport reserved for people with money," she said. "I don't think it's a good representation of the U.S., or of society as a whole." And indeed, diversity in athletics is an issue in many sports, not just fencing. Moreover, Muslim women all over the world face a myriad of challenges when it comes to being able to participate fully in sports. But Muhammad joins a long series of Muslim women who have blazed new trails in the world of sports, all of whom are worth celebrating. So what other notable Muslim female athletes have there been? What's the status of Muslim women in sports? What are some of the issues confronting female Muslim athletes? Well, here are a few things to give you some perspective. In Muslim-majority countries, there is often a cultural bias against women playing sports, particularly in a highly public setting such as on a professional team in a giant stadium. However, many argue that the Qu'ran and the hadith, which together form the basis for Islamic law, actively supports the idea of women playing sports. Health and exercise are, after all, recommended for all Muslims, which includes women. And there are accounts of the Prophet Muhammad racing with his wife Aisha — and that she even beat him on several occasions. This suggests there's nothing wrong with women seeking to compete physically on an equal basis with men. There are many thoughts on the subject, and Muslim women in Muslim-majority countries often face an uphill battle when it comes to getting to participate fully in sports. However, plenty of women see no contradiction between their love of sports and their faith. While Muslim women in Muslim-majority countries often face cultural barriers because they are women, in the West these athletes often face barriers for being Muslim, at least if they wear the hijab. Perhaps the most striking example of this is the long-time ban by international soccer organizing body FIFA prohibiting athletes from wearing hijab on the field. The ban was fortunately lifted in 2014, allowing women who choose to dress modestly — or who live in a country where it is required — the chance to compete, but the fact that it was implemented in the first place sent a terrible message. And unfortunately, it's not a problem confined just to FIFA. Muslim athletes at all levels and in a wide range of sports have to deal with dress codes that sometimes force them to choose between their sport and their beliefs, forcing women to and girls to get creative if they are to continue playing at all. Despite these obstacles, many Muslim women have proudly participated in sports, with the London Olympics being an especially crucial milestone. 2012 marked the first time that every participating country sent female athletes to the games, including conservative Muslim countries where women are rarely allowed to play sports. Even Saudi Arabia sent two women to the games: Sarah Attar, who participated in track and field, and Wojdan Ali Seraj Abdulrahim Shahrkhani, who competed in judo. Overall, the London Olympics were a banner year for women's participation, and the fact that so many Muslim women were prominently featured in both the national and international press bodes well for Muslim women's participation in sports going forward. Women in conservative countries still face many obstacles, but representation is always important, if for no other reason than it sends the message such things are possible. London might have been a big year for Muslim women at the Olympics, but it wasn't even close to the first time a Muslim woman competed at the games. In fact, the first time a female Muslim athlete competed was in 1936. Like Ibtihaj, she was a fencer — and she was also pretty badass. Halet Cambel competed for Turkey in the individual women's foil during the 1936 Berlin Olympics. She was invited to meet Hitler but refused on political grounds, and she then went on to be an archeologist and a professor, marry a Communist poet, and live to the age of 97. Halet Cambel was obviously amazing, but she was also not the last Muslim woman to compete in the Olympics. There have been a long line of them. The first Muslim woman to win an Olympic gold medal was Nawal El Moutawakel in 1984. The first Muslim woman to wear a hijab while competing was Ruqaya al Ghasara in 2006. Some of the women who compete have faced disapproval in their home countries for the decision, such as Hasiba Boulmerka from Algeria, who was criticized by extremist groups in her home country for wearing clothes that were too revealing during the competition. Other women have been celebrated by their homelands, such as Ghada Shouaa from Syria, who won her country's first and only gold medal when she competed in 1996 and became an instant national hero. One thing is for sure, though: There is no shortage of excellent Muslim women at the Olympics. The Olympics are not the only place that Muslim women can be found in the sports world, of course. Soccer is particularly popular — which isn't surprising given that soccer is the favorite sport just about everywhere that isn't the United States. Many Muslim majority countries have women's national teams, (and more are launching them), though some countries, like Saudi Arabia, are still resistant to organizing an official team. Efforts to organize international tournaments for women in Muslim countries have been difficult. The Arab Women's Championship, for instance, was held only once in 2006, before lack of resources made in impossible to continue organizing. Additionally, women athletes in many countries face additional obstacles due to sexist laws. For example, Iran's women's team captain was unable to compete in an international tournament because her husband wouldn't give her permission to leave the country. In Iran, it is also prohibited for women to attend soccer matches. However, even in a place as restrictive as Saudi Arabia, women still organize unofficial leagues and find a way to play. And of course, there are plenty of Muslim women who play sports right here in the United States, and who do it very well. From college basketball stars like Bilqis Abdul-Qaadir, to weight lifters like Kulsoom Abdullah, and to, of course, fencers like Ibtihaj Muhammad, Muslim women are also blazing trails and doing great things in the world of sports here at home.